Love it! Reminds of when shareware games in the 90s did Christmas versions. Been seeing your regular updates, sounds like the game has come a long way. I've been waiting before playing again - any new updates in the near future or is now a good time to jump back into the game? Wow these are awesome updates! New traps, new class, final boss? Also really cool to see "Holy magic that heals normal character damages undeads."Awesome. Stumbled across this game in the Itch devlogs, and was surprised how much content is already there. Can't wait for more updates! Only real problem I encountered was the path-finding of trade wagons, they tended to ignore roads and go off and get stuck in a corner between buildings. I tried setting waypoints but they also paid them no attention. Judging by the title, the Bronze Age and bronze upgrades will be final era in the game? Or will it later go further e.g. iron and steel? itch.io Community » Game Development » Release Announcements · Replied to icefill in Sigma-finite Dungeon: Tactical turn based team battle Roguelite just released. Haha, hopefully my blog will bring new challengers. I don't have much time to manage the blog unfortunately.. it used to get around 1,000 views a week, but probably less now since I rarely update it.. but hopefully you get some downloads out of it! itch.io Community » Game Development » Release Announcements · Posted in Sigma-finite Dungeon: Tactical turn based team battle Roguelite just released. Awesome, really amazing how you updated the game so fast. Being able to sell items to the shop and increased inventory size are really nice additions. Hope that it helps more people to find the game! Classic tactical combat! Exactly what I was looking for. Difficulty felt right, I needed to make good use of all my abilities to survive combats. The variety of classes is really good and adds re-playability. There is a really nice variety of skills and spells. It was always exciting to find a Skill Master or Scrolls (which I could use to learn or upgrade spells). There's a nice range of weapons but I didn't find many equipment upgrades and in general equipment didn't add much depth. In my three playthroughs, I tended to find some better equipment on the 2nd or 3rd floor (usually after the boss fight), and after that all the items dropped or in shops were usually worse than my current equipment, until near the end of the game. Maybe more variety of equipment types (e.g. helms, amulets, boots) in addition to weapon and armour would help provide more chances for upgrade options. Also, equipment with more variety of effects (e.g. attributes like strength or dex, some grant skills/spells, or some grant abilities like boots that increase moving +1 distance or archer gloves that increase the range of bow attacks, etc. ) would add more reason to invest in equipment and make strategic choices over equipping your team. Since you can now sell items to the shop, to balance things it's probably necessary to lower the amount of gold dropped by enemies / at the end of battle. I ended the game with about 6,000 gold, even after buying every skill and every useful item in shops. Another healing class would be cool, for example the solider could promote to paladin with defensive abilities and heal. One time one of my guys died during a tense battle. I quit the game in rage and reloaded the next day. In the battle, the enemies which killed the guy would attack the dead guys corpse every turn. Interestingly, my characters could also attack the corpse, and get EXP for it. Not sure what happened, but I guess it's something to do with closing the game just as a character dies? When I promote a character, the class promote buttons are still present on the left side, clicking one crashes the game (CTD). E.g. I promoted my "novice archer" to "archer", and both the novice archer and archer buttons were still visible. I clicked "archer" again and got a CTD. I wouldn't mind more traps and hazards in the levels (maybe more things like water or pits to push enemies into). At present I have not had much opportunities to make use of traps or barrels with the push, drag, etc commands very often. On that note, also being able to sell stuff would be really awesome. All in all, great game. Aside from the top bug, has been an overall smooth experience and have been enjoying immensely. Hope these reports help! Really like this game. I was writing a long detailed post about my thoughts before accidentally refreshing the page and now its all gone, forever. So instead now I'll just say its a nice mix of party-based tactical battles with dungeon crawling. Is it infinite or is there a final dungeon floor? Been enjoying the game a lot and the latest update is great! The "sneak peek" on containers is a godsend. Sometimes the character gets stuck in place & starts walking on the spot, and you can't move at all. Opening and closing the inventory seems to "reset" it and you can move normally again. It seems random- couldn't determine if there was a specific trigger that causes it. Some enemies (droids) seem to resume moving around after killing them, but the sprite is all glitchy, seeming to flick between its normal and dead sprites. Walking up to them doesn't trigger combat. Once I killed a droid and some ZZZs appeared above its head, and combat didn't end. Clicking on the robot corpse the game told me it was unconscious. If I waited a turn or two, combat ended, then I could loot the enemy's corpse like normal. Not sure if this is a bug or just a quirk of the game? Various doors/containers say "used keycard", for example on the space wreck, despite my character not owning any keycards except for the one you start with on your own ship. Seems unintended? This game looks interesting! 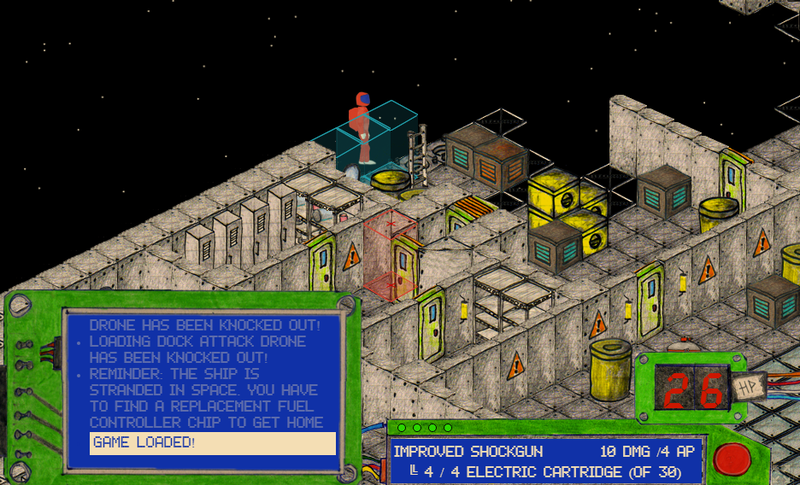 At first from the screenshots I thought it would be like classic UFO/X-COM, but a few minutes of play gave me a strong Fallout 2 vibe (which was probably no coincidence judging by your profile pic ;) Will be following this with close interest! Ah I see, so annoying that you have to manually request that, but I guess it makes sense. For what it's worth, I tried marking the file as a false positive and submitting it to AVG also. 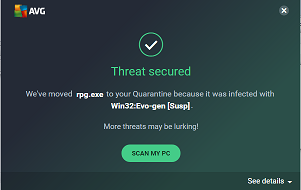 I managed to quickly disable AVG for a couple seconds to load the game then reactivate it (otherwise it automatically deletes the gamefile without giving me any say in the matter). It was tons of fun, and exactly the classic FF5-style job system I'd been craving. Can't wait for more! Guessing it's a false positive - not sure if there's any way to change it? Even though I couldn't try it out, love the look of the class system, there really isn't enough classic RPGs with these anymore! I finally updated the game (my first update broke the game, and I had to go back to the drawing board for a while)! If you have the chance, check it out and would be great to find any other bugs or feedback out. Unfortunately due to some major code changes, save games won't carry over to the new version... Hopefully that kind of thing won't happen once I shift it out of "prototype" status. Thanks for reporting this, and thanks for playing! Both these should be fixed now, will hopefully upload the updated version tomorrow. Post any bugs, errors, issues or other feedback here! Hey Keyband, good to have you back! I saw you posted a couple games, looking forward to playing them soon! I think quests will be a good idea, currently the game sort of has quests - when it or the farmer suggests something you should do. Later in the Adventurer/Dungeon side of game I think I will have more formal quests, like rescuing trapped miners from monsters, for example. Aside from that I haven't given the sequence problem much thought, I just updated the game with some massively cleaned up code, so from here, I'm gonna go back to brainstorming about the sequence idea and see what I can come up with. Thanks for the comment! Glad to see the update brought you back! ;) I am definitely planning on expanding the Workers-side of gameplay in the next bigger update, not only will you get more workers, but they will each have their own stats and skill rankings, and can equip tools. (this is built into the code but not implemented into the gameplay yet)! You were right, the Scythe price was displaying wrong - well spotted! Currently the HTML for upgrades is static, something I need to automate in the next update. #2 and #3 are not a bugs, per se, just to do with unlocking order. E.g. for Silo, you have to wait til you get the Upgrade Storage Shed upgrade, which unlocks after you explore the Cave. It IS a bit weird to give the Silo upgrade before its possible to afford it, though. It raises an interesting design question: I've noticed people tend to max out their resources and get all upgrades before moving on to a new section of the game whenever possible. Then, when they unlock new stuff they already have the resources to buy any new upgrades instantly, which trivialises the importance/impact of the upgrades. Ideally, I want a way to introduce new upgrades where the player can't already pay for them without some kind of new planning and work. E.g. when Party Slot is unlocked, you need 1000 wheat. To store that much wheat, though, you need the Upgraded Silo. But, to pay for that, you need 300 wood, so you first need the Upgraded Storage Shed. I think that makes an interesting chain of planning for the player. However, if the player has been maxing out every resource and upgrade as soon as it appears, instead, they can just buy the Party Slot as soon as it appears without much thought, reducing the significance of the upgrade to just a button click. Not sure what the best approach to that is though, without forcing it - ideas welcomed! The game is more of a prototype. The incremental side needs fleshing out. It overall needs more content. But... it's a working, breathing, framework. You can: gather resources, explore caves, upgrade stuff, unlock new resources, fight monsters, craft weapons and armour, hire adventurers, and reach a final dungeon. I'd call that a success! More than just numbers increasing - success! The game has item gathering, upgrading, currency exchange, item crafting, party management, exploration/dungeons, and RPG battles. These features can all be fleshed out, but its already a good variety of stuff. A clear ending: a narrative with an end goal. Sort of. The game has a clear structure, with dungeons, but there is no real narrative and I wasn't able to create an end boss. The game does tell you when you reached the final dungeon, though. Avoiding ridiculous numbers - success! The multi-currency system works better than I expected. Having multiple currencies definitely pads things out. Moreover, the currency exchange market, with its shifting rates, means that you dont even get 100:1 rates, so it takes quite a while to upgrade money. I tried to make a game multiple times over the last 10 years. 10 years! I never succeeded. This time, for the first time, was different. Why? There's probably no easy answer, but I'll try. Keeping the interface simple - It's purely text-based, there are minimal graphics (basically just icons) and there is no animation or sound. The characters (adventurers, NPCs, etc) always just appear in a list, without sprites aside from a portrait. Fighting is just the characters' portraits, and nothing is animated, exploring dungeons is just an "explore" button with a percentage that goes up. Inventory is a fixed order list - so no inventory-tetris to worry about coding. With just a basic CSS, it still looks a bit like a game. I think it worked surprisingly well. Not so much simple mechanics, rather implementing them simply - not sure how to explain this, but something I felt I really did (surprisingly) well is finding simple ways to implement my ideas. There's a lot of complexity under the hood, for example, combat-turn calculation system, a passive skill training system, a functioning currency exchange market, craft-able weapons/armour. However, combat turns are "instantly" displayed in a text log, skills/weapons/armour don't do anything more than flat atk/def bonus. Currency exchange is randomly generated. I think this turned out quite well, though. My only real regret, mechanics-wise, is not being able to make combat more than just "attack / defend". Starting messy - A lot of people look back and say they didn't plan things out enough, and their code was too messy, and urge you not to do that. I say, if you are a beginner, you should! Rather than plan everything ahead, design notes on paper, and so on, I just started. Yes, the code was messy, and yes, sometimes I realised my approach sucked and had to rewrite stuff. But, I think this was valuable experience. When you are an absolute beginner, carefully planning ahead can make your scope too ambitious (because you don't understand what's technically feasible yet). By coding it straight out "by hand" first, it helped me to just try my ideas out and see how well something works (or doesn't). If something didn't work, it was much easier to figure out why. Only once ideas were concreted, my game code became modular. Of course, this doesn't mean I think it'a a good approach. I just think it's useful for people doing first time projects to get started, and get their hands dirty. (It also depends on the type of project.) Once you're better at game design and coding, you probably should not take this approach. The main things that I didn't complete properly was fleshing out the incremental side, and adding a narrative. My first post jam update began to address this, though. Lots of new craftable stuff that requires the incremental's resources and upgrades like "adding a party slot" which requires lots of wheat. 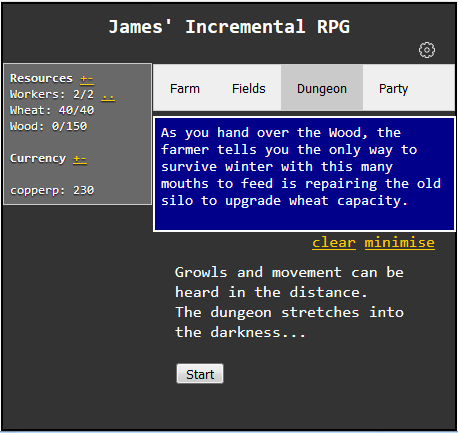 Exploring also costs "food" (wheat), meaning now the incremental side is starting to fuel the RPG. But I'm happy with it. It just meant that my first game is more about learning to put something together and code, and ambitious story telling and a design-orientated approach will come in future games. and more of everything else! I also have plans for a future MyFirstGameJam game in Summer. I drafted an idea ages ago for a Monopoly style game called Minipoly, with the goal of addressing the hideous balance issues in the original (which were apparently intentional to demonstrate the horrors of capitalism), to make something more dynamic and much, much faster to play. Managed to quick-fix a couple bugs. Since crafting works, I removed the free starting items - now you have to craft them yourself first. To compensate, added a few weapons and armours to craft, so there's a slightly better range now. Technically, there's not much incentive to not just save up resources for the best equipment first, but at least the options are there. The game is definitely more of a prototype than anything else, but I'm happy I got to create something that pretty much works. I can definitely work from the foundation I've built here, and although I will take a break to refresh, I hope to flesh it out quite a bit in future. Plans include, fleshing out the incremental side a lot more, and making combat much more interesting, and tying them together better. Ok, there are massive narrative gaps and balance issues, but the foundation is set. I've never gotten this far before in making a game, ever, so it's a big achievement for me and couldn't be more pleased with myself. I will probably take a break for a few weeks after this, but definitely come back and flesh out the content. There's tons more I can add. Fixed a few bugs, e.g. skill progression always saying "gathering skill"
Money balance isn't well-tested - progression on the game depends on getting the first round of upgrades. It shouldn't normally be possible to get into a dead end, but it may be. For example, playing around on the currency exchange and losing money, might get you into a dead end where you cant afford the necessary upgrades to progress the story. You can have too many people in a party - you are only supposed to be able to have 4 people in the active party. Trying to make more than 3 adventurers (plus you) in the active party might break the game. Could not get a final boss fight - you just get a msg when completing the final dungeon. Anticlimatic, I know. But to make a special event like a boss fight, doesn't work with the standard explore and combat functions, so entirely new code would be needed. It was a bit of a rush, but crafting works! There's a bug for complex items - when displaying materials, it shows "object", but rest assured the creation process does work (and if you dont have enough materials, it'll then tell you more clearly what you need and how much. Probably won't get time to implement more than that by tomorrow. Oh, and you start the game with a range of gear - enough to beat the game directly, anyhow. Have fun! It was too easy before to endlessly defend in the first dungeon, losing 1HP a turn until you die, then heal and repeat, grinding your "Defense" skill quickly. I found myself doing it even though I made the game! Patient players can still grind, but it shouldn't be that powerful. So, defend now gives decreasing returns, each time you use it consecutively, its reduced by 0.1 (10%), down to a lowest of 0.1 per turn. Just taking a 1 turn break will "reset" it. Stone and iron-ore discovery has been shifted to one step later. Instead of having stone automatically upon discovering the cave, now you have to explore the cave first to find stone. 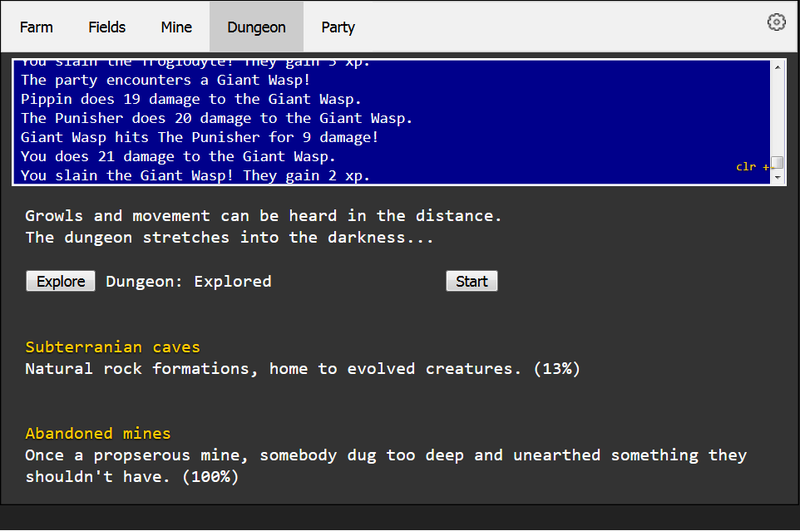 Likewise, once it becomes a mine, you then have to explore the mine to find iron ore.
After exploring the mine, instead of going straight to a classic dungeon, a tab called "Deeper" opens up, exploring deeper into the mine. You can encounter slimes here. Next, it changes to "Tunnels". 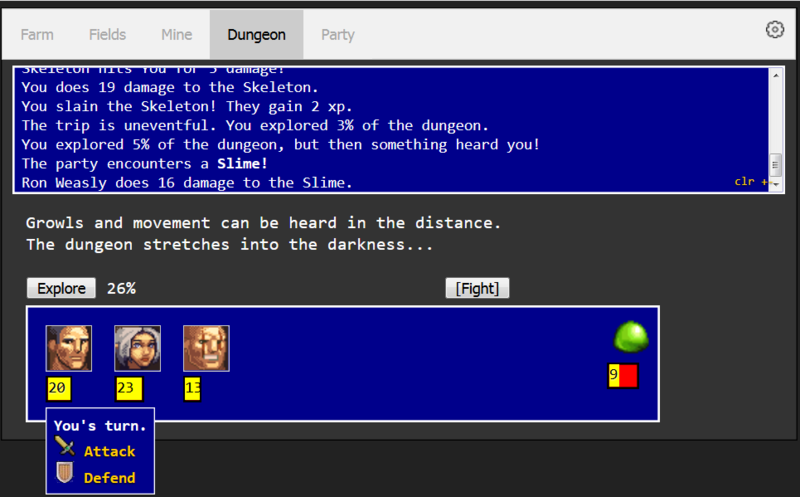 Finally, once you finish exploring tunnels, the tab changes to "Dungeons" and proper dungeons open up. Finally, the Party menu doesnt open up until you've reached these proper dungeons now. This all pads it out a bit more nicely. Exploring is still a bit overpowered. When exploring, there's a 3/4 chance for combat. But you still get some % of exploration added. It's lower than if there was no combat. However, its easily breakable. E.g., just enter combat at 1HP, die instantly, repeat. You lose all combats but each time gain a little %, up to 99%. Combat can't push exploration past 99% so you have to win at least one combat to beat a dungeon. It doesn't "break" the game, since you can repeat dungeons and farm for XP regardless. Still, it's not the best. I'll probably have to rethink that system one day. Most probably, I'll do something like I did with the defense tweak. Encounter rates are still high, and encounters still give some exploration %. But... each lost combat gives less exploration % - so entering combat, fleeing/dying and repeating will give less and less exploration %, down to 0%, so that you can't game the system. Winning a combat will reset the exploration % rate back to normal, and will also lower the encounter rate, so the chance of multiple combats in a row gets less and less. Dying or running from combat will increase the encounter rate, as well as lowering exploration gains. So basically, you will be far better off winning combats. Write a postmortem in a day or two. Warning: have not tested it at all! Update 9: Live Preview Online! Finally you can equip armour AND weapons. No more naked adventurers running around! Weapons and armour actually have an effect! (e.g. swords increase damage, armour reduces damage). different skills have different "difficulty" to learn, making them take longer to learn, and once learned, they also have different "learning rates", taking longer to level up. being "untrained" in a skill now imparts a penalty, while being "trained" gives you a bonus. (the bonus worked before but was hard-coded in, now its properly coded via functions). untrained skills can have multiple "negative levels" meaning higher penalties, but as you level closer to 0 the penalty reduces with each level closer. Once you get to lv. 1, the skill is "learnt" you get the bonus instead of the penalty, which also increases with each level. when you learn a skill, the game notifies you, if you are still in negative levels the game gives you a (pretty obvious) hint that you are improving in that skill. Gathering, Chopping, Mining, Combat and Defense skills fully working now, affecting the relevant skills outcome. Enemy's defense actually does something now! Trading skill added which improves market rates. As mentioned, NPCs now appear on a list on the left side, regardless of location, making better use of empty space. The tab will show the NPCs in the current "room". I plan to make this menu become also more context-sensitive, later, though. E.g. it could show other general actions you can perform, that dont fit into normal area of the tab that you are on. I fixed up the code so gaining skills is no longer hard-coded per skill (I generally hard-code it in one or two areas to "test" my idea, then I create a function and use that instead). This means that adding new skills is now easy and scalable. More importantly, I expanded the skills system a bit and pretty happy with how it works now. It's way more complex now, though in relatively subtle ways. Like before, when you perform an action, the game checks if you have the related skill. If you have it, a bonus is applied and the skill gets XP. If you don't have it, you get the skill, but "untrained". However NOW, untrained skills incur a penalty, as opposed to trained skills giving you a bonus, to whatever you are doing. Furthermore, skills have a ton of other properties. Untrained skills can be more "difficult" to learn, begining at lower levels (-1, -2, etc), and start with lower -XP levels, meaning it takes longer to reach the holy Lv. 1 when you start getting bonuses instead of penalties. Skills can also have differnt learning rates, basically the rate it gains XP while untrained, and training rates - the rate it gains XP after its trained. Generally speaking, the untrained XP gain is double that of the trained XP gain rate. Skills also have different XP curves (affecting how much the XP requirement increases for each level). This adds a ton of customisation to skills, and (to me, at least) makes them a lot more interesting and variable. You can see it in action here, in the currency exchange menu. The [dev] info (only appears when "devmode=1") shows the underlying variables. The base rate is 100 copper to 1 bronze, with a market rate of 1.03 meaning its 103 copper to get 1 bronze at the moment (a pretty good deal!). But you are also deeply untrained in the "Trading" skill. The initial level of -2, with a penalty of 2 per untrained level, meaning the maximum penalty of -4 value to all trades. In other words, for buying copper, it costs 4 more than the actual market rate. For selling bronze, you get 4 less than the actual market rate. Eventually, from lv.1 onward you'll get a bonus of +1 per trade instead, getting more bang for your buck when buying and selling. If I can get those done tomorrow.. the game might actually be a "complete" experience. Basically a prototype, but hopefully an interesting one! Update 8.5: More Currency & Skills + UI tweaks... and live preview online! Well, we are almost there.. this will likely be the second-to-last main update! That's the version from about 2 posts ago, but feel free to try it out and play around with the systems, and find the inevitable bugs that lurk there! Finished implementing the currency exchange and got it fully working. You can now exchange back and forth from copper to bronze, which is enough for this stage of the game. The passive skill system is now also fully implemented - characters can gain a handful skills after performing actions enough times, which level up overtime and boost the skill. Numerous UI improvements, NPCs appear with icons instead of just buttons! Rounded borders! Shadows under the menu! Help info is contained in a default invisible div tag, and when you click the ?, it toggles whether that div is visible or hidden. Simple, but so effective. It's a nice way to give more info than a tooltip, but short of creating some sort of help manual. I will add a lot of these through the UI, which will be very helpful - especially since the narrative and game flow that would guide the player is not properly established, it makes the game actually sort of playable in the meantime. Normal menu popup, with help text hidden. After the help is toggled on. Note also how the exchange rate for selling 10 Bronze is slightly different than the rate of 1:92 would suggest, due to rounding. For now, I like this, as it adds some variability to searching for good deals - sometimes the rounding will work in your favour and sometimes against you, depending on what trade you are looking to make at the time. The nicest update for me though is the new menus. I created a "shadow" div, which you can see in the above pics, to make the menus look like they are floating above the main area, which helps to distinguish the menu from the main game stuff, and I found out you can do rounded borders in HTML, which makes really look like old school RPG menus a la Final Fantasy now! The exchange system is fully implemented, with backward and forward exchange rates. You can trade 1 or 10 copper into bronze, and a market rate (as explained in my last post) is applied on top of the standard 100:1 base rate. Market rate randomly shifts, and is updated live in the currency exchange window (if its open). Backwards exchange rates work, but similar to real life, are always less value (in this case a flat rate of 25% less). Exchanging back at this time, in theory would give you 10,000 copper back. But, for downwards conversions, with the 25% commission cost it ends up being 7,500 copper. Doh! A 2,500 loss. Just like real life, you don't always get back what you put in. So instead, you hold on to your 100 bronze and wait for the maximum rate, which is 1.75 - or 175 copper for 1 bronze. Exchanging 100 bronze back for this rate would get you 13,125 copper. Certainly, a lot less than the full 17,500 copper it's supposed to be worth - but look! - you only spent 10,000 copper for it originally. That means, a profit of 3,125 copper... all for doing nothing but waiting. The rate is pure randomly generated every minute. A wishlist item would be to make the rate instead move in "points" much like real stocks and commodities, moving upwards or downwards over time, which, while still randomly calculated, would feel a lot more real. I might also need to tweak the 25% margin so that arbitrage is not too powerful, but for now it's good enough, and it's kind of cool to have an alternative source of money management. Skills have been slightly fleshed out. Basically, when you perform an action associated with a skill, the game checks if you have that skill. If you have the skill, it gets a small bit of XP (1-10pts). Your skill level (generally) boosts whatever action you are performing; the higher your skill level, the higher the benefit. Both the player and adventurers can gain skills, later I will make it so workers also gain skills. Later I will have skill levels for Swords, Daggers, and armours and so on. Lots of potential here, such as a skill tree. E.g. once you get lv. 10 in Swords, it unlocks the duel wielding skill, enabling you to equip two weapons. I can also make a skill that adjusts the base market rate, e.g. down to 90:1, so that you always get better rates. Ah man, sorry to hear about that. Luckily I still use Windows 7 😅 the game looks basically playable already, but hope you get the chance to polish it off soon! Regardless of whether you finish it during the game jam or after, I'll definitely be playing. Aaaaand we're back to the incremental side! Finally! 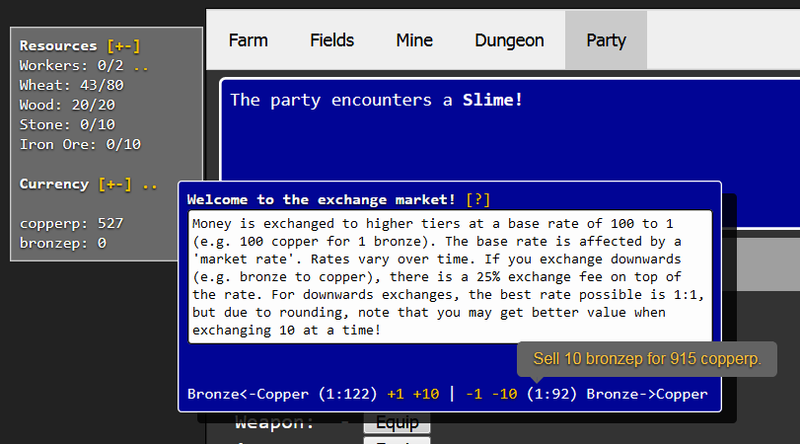 I did a number of tweaks and formatting changes, and fleshed out a bit more UI, and added some features to begin tying the incremental into the RPG: dungeon farming, and crafting, character skills, and a functioning currency exchange market. Finally, I've added the beginnings of an "end game" script, and shifted all the special in-development buttons into a "dev mode", all of which signals the final stretch of this "prototype" game is starting to creep nearer. Curreny exchange: get rich on the market! Once you have enough copper, bronze coins open up. You can exchange them at an initial rate of 1.25 copper for 1 bronze. Rates change every minute, so in theory it is possible to game the system. Crafting new tab added, and game now lists craftable weapons and their relevant material costs. Clearing the final dungeon triggers end game script. A pretty big gameplay addition, but surprisngly simple to implement. It basically operates the same as a shop - the only harder part is that instead of just a single currency cost (e.g. copper) it needs to "cost" various variable materials as well. Luckily, it uses the same logic as a lot of other things - like showing the equipment menu, except instead of listing equipment based on how many you own, it checks a flag property for whether the "blueprint" is "available", and then if so, loops through its "materials" to display the cost to make it. Currency exchange is reasonably self-explanatory. Once you have over 400 copper, the exchange feature unlocks and allows you to change your hard earned copper pieces for bronze pieces. Of course, the spirits of the exchange market need to take their cut, so you don't get 1:1 rates. All rates are based on the base formula of 100:1, as mentioned way back in my second post. A "market rate" is then applied on top of this. The default rate of copper is 1.25: which means 100 * 1.25 = 125 copper for 1 bronze. Steep! However, the market rates change over time. The lowest you can ever get is 1:1 (i.e. 100:1) which is nice! Except for silver, which can never go lower than 1.5:1 (exchanging it into gold) and gold, which can never go lower than 2:1 (exchanging it into platinum). Currently you can only "forward" trade, that is, go from copper to bronze, bronze to iron, and so on. Though I will implement "backwards" trading, so a clever trader may be able to take advantage of arbitrage. In this version of the game, you'd have to remember the rates at which you bought everything, and patiently watch the market rates. However, in the distant future I will add upgrades to help facilitate this, such as notifications when rates change, and tracking your purchases to help you secure the best value deals. It's a potentially neat little "game within a game", but it won't be essential. Basically, if you prefer trading than dungeon farming, this feature will be for you! Speaking of farming: after clearing a dungeon, a button now appears that lets you trigger combat in that dungeon on demand. In other words, you can "farm" monsters in the dungeon. This is a good counterbalance if the player got "lucky" and progressed a bit too fast, ending up in a dungeon that's too difficult. Currently it's only good for farming XP to grind levels. But it opens up the way for monsters to drop useful loot and materials used for crafting. Although I wont be able to make a cool active combat skill system before the gam jam ends, I do plan to implement a basic passive skills systems. 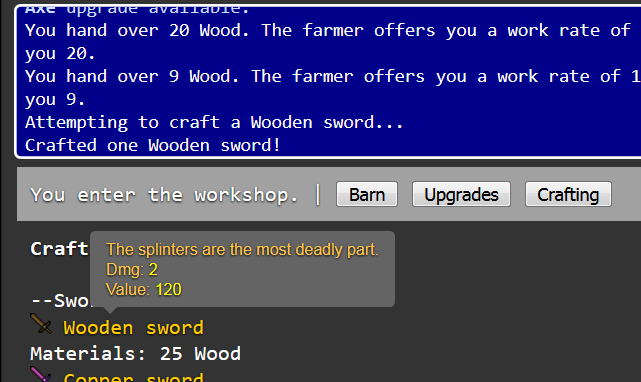 Everytime you gather wheat, chop wood, etc, you shold get skill XP. When you level up, you can gather more resources and carry more resources. Characters in combat shouldalso gain XP in the weapon type they are using, such as Swords. When they level up, their damage with the weapon type increases. Currently I've implemented the first steps, adding it to Player/Adventurer objects and code to display and skills possed by that character. Next, I need to implement learning of skills, and the skills effect on combat/gathering/etc. Now, when you progress to a point where the game would make something new visible in the UI, the game explicitly tells you this. For example "[Upgrades] tab unlocked. ", "[Stone] resource discovered. ", and so on. Normally they say "show not tell" but in this case, the addded message seems to add a lot more game feeling, I think it makes the feeling of unlocking something more official, reenforcing a feeling of progression. It's also useful as sometimes a new element appearing might not be so obvious, and players may not have realised there was something new to do. Dungeons also start to give some descriptive messages when exploring: how much you managed to explore and whether you explored unscathed or if something heard you. Later I can add ambient effects as well, like "You hear noises." or "This section of the dungeon is lined with orante pots. ", etc, for a bit of RPG flavour. When the last dungeon is cleared, you get a message telling you that you've cleared the final dungeon (congrats, you! ), and a button for the final battle will replace the normal dungeon button. Nothing further happens, yet, but it means the hook for triggering the end game (or end of "chapter 1"), is in place. This flag will determine whether extra controls and debug info shows up. It has stuff like gathering full resouces instantly, and the like, for faster testing. Now, the game will only show this stuff if "devmode" is switched on. Why doing this is signifiant, is that it signals the game getting closer to the real thing! Adding a devmode toggle means I can now have a "public" version of the game, but still turn on devmode and test it when needed. Thanks for the toughtful coments. That's a really good point about narrative and decisions. This update sees the introduction of party-based combat and a series of 4 dungeons to progress through. Battles are turn-based, the game uses a basic "speed" calculation system to determine turn-order, and (for now), everyone patiently takes turns hitting things until something dies. Or the whole party is dead. Fun times. All adventurers can now equip weapons! Building the game systems to this point was a lot more work than I expected. An RPG is definitely way more complex than the incremental side. There are so many menus, people and stats to keep track off, and things like equipping things and dying, that all need their own functions to be coded. Getting the systems in place took a lot of work... And a lot more debugging. I repeatedly used the word "systems" rather than just game, but at this point that is what it is: it's not a game, but a game system. I realised there is a key point when a series of game systems becomes a "game", where everything starts interconnecting and the player is driven by some sort of progression (most often some sort of story, or at least "winning the game"). I won't be able to finish a "game" within the next few days, but at least I can try and tie it together with some sort of purpose. There are now 4 dungeons and a prelimary area, let's call it the "zero dungeon" for now, which gets discovered after fully exploring the cave. The first (zero) dungeon is not dangerous at all and easily tacklable by the player. From there, new proper dungeons open up, but get more dangerous. The player pretty much needs to recruit Adventurers from the first real dungeon onwards. Currently each time you click "explore" there is a 3/4 chance of facing combat. The monster that appears depends on the "dangerlevel" of the area. Once you've managed to get 100%, the next dungeon opens. It's not implemented yet, but completing the final dungeon (good luck with that!) will give some sort of "Victory!" message. Currently there are two options: attack and defend. Attack is self-explanatory, doing direct damage based on str (for now). Defense is slightly more complex, it halves damage received until your next turn. It also "costs" less (more on that below), meaning a character who "defend"s will act again a bit sooner. Sadly, that is as complex at combat will get during the game jam, I think, due to time limits. In future, I definitely would like a skill system, but... c'est la vie for now. To determine turn order, I used a method loosely based on Final Fantasy Tactics' system. Characters have a "Turnpoints" property. Each round, their AGL is added to it. The character with the highest Turnpoints then acts that turn. After acting, their TP is set to 0. And everyone's TP is calculated again for the next round. Repeat. I could make skills or attacks that affect turnpoints, thus changing turn order. E.g. "interrupt" which halves target's TP, or "stun" which sets a them outright to 0. Skills lowering AGL would have an important effect on combat! E.g. "slow" spell. Different actions could have different TP costs. This could be based on the type of action, like attacking takes all TP but defending only cost 80%, meaning defenders will move again sooner. But I could also assign each ability/skill its own "TP cost". So we could have all sorts of things like quick, weak but fast slashes. Fast fireballs, or slow powerful explosions. Lots of options here, which is exciting. Sadly, I won't have time to implement anything that makes use of it during the game jam. But it's nice to know the framework is there. There are currently 10 monsters. Growing from a simple slime up to dragons and the evil warlock, your final goal. I thought I could leave things like AI to the side for now but no, just even picking a "random" target required a lot of work. It can't be a pure random number range, e.g. 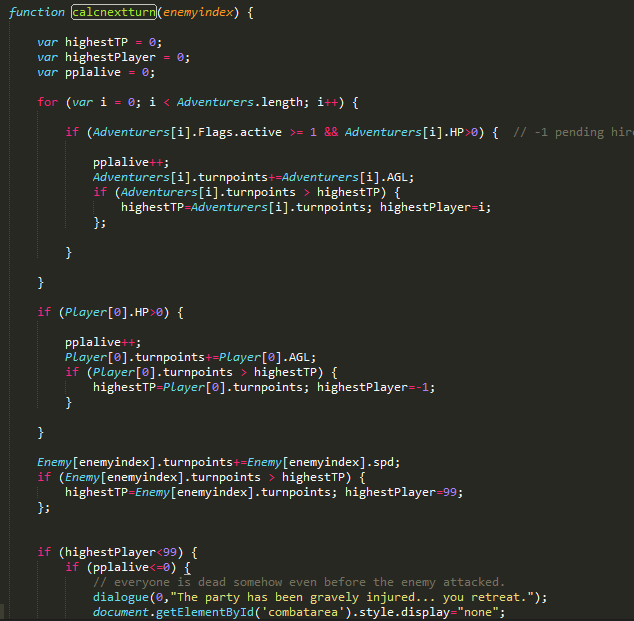 1-4, as the adventures and party size are all variable, so I needed to code a (basic) system to "choose" a target. Of course, this still requires various checks. Is the target alive? And so on. Add a "aggro" property that builds up (and can be affected by skills, equipment, etc) that creates a bias on the "random target"
Add skills which, conversely, set "aggro" to 0. Such as "hide" or "invisible" which will be good for rogues and casters. With the addition of enemies and dungeons, there's scope to make some kind of "winnable" scenario for the game jam. There's a bunch of technical things that are still needed, like making armour equippable, and actually implementing weapons and armour to affect dmg or def. In the bigger picture, the systems need to be tied together. Primarily, the incremental side needs to feed the RPG side. Adventurers need to require reputation (gained from clearing dungeons) to appear and cost money to hire. Weapons and armour need to cost money and resources to "craft". Each dungeon needs to scale in difficulty enough so that you need new adventuers, weapons, and armour to progress. That will drive expanding and upgrading your farm to afford this stuff. I haven't had much chance to get to focusing on narrative, though I do have plans. For now, I need to at least create a mystery and clues, so that people want to not only finish this intial "game jam version" but with a cliffhanger ending that raises more questions, that can only be answered when you play the "post jam version." A quick update because its 4am, but after a couple day break, I crammed some work in and the game now has the beginnings of an adventurer system! You can hire randomly generated adventurers and add them to your party. You can now hire randomly generate-able adventurers! Health regenerates over time, at a default rate of 1/s. Thus, if you die in combat you don't automatically get full health anymore. The system so far is pretty basic, but the goal was to get the framework in place. You can hire adventurers, and the game saves them, and dynamically fills out your party screen as needed. Currently, you just click "Hire" and a fresh adventurer is generated. You can then hire, re-roll their stats, get a fresh new adventurer, or reject them entirely. In the "final" game, it probably won't be this easy - there may be a pool of shifting adventurers (e.g. in a tavern), rather than generating on demand (but I needed to build the code for generating adventurers in the meantime). Initially, the stat distributions will be lower, as you get lower quality adventurers. But as your reputation goes up, not only better classes, but those with better base stats, will start to show up. ...which all had exactly the same result. After playing with a few, in the end it really was as simple as just "adding" a few different random numbers together, and playing with the numbers to get the bias I want. I set a bias of around 17, because let's face it, RPG players reroll until they get decent stats, so this speeds up that process. You can still get unlucky and get single digit stats, so it's not a cakewalk, but generally, it shouldn't take too many rolls to get something decent. Of course, the weighting will probably change in the full final game, but it was fun to play around with. As simple as it should seem to just make two tooltips appear at once, it was very problematic. long story short, the way the code is set up, it's just not possible - I coded myself into a wall, and would have to rewrite a lot of things from the ground up. I need to continue integrating the adventurers, primarily so they can also be equipped, and then add them to combat. I'm planning a basic turn-based battle system, where characters take turns in order of their SPD stat (which will probably be derived from DEX+AGL for now). Then, dungeons need to be fleshed out, to have multiple encounters, and the ability to "clear" them, opening up the next dungeon in the list. For now, the narrative and deeper roleplaying elements are a distant dream, but I'm hoping, with 8 days left, that I will get a few solid days in the end to purely focus on story and world building! Thanks for sharing the video! I plan to do a deeper post later on incremental design, and I think in that post I'll link to that video and some good reading materials which I found. One talks about "known knowns, known unknowns, unknown knowns, and unknown unknowns" which nails the draw of "incrementals" really well, I thought. Thanks! Great to hear the feedback, now I know at least one person will play it! Another fun (albeit bare-bones) feature has been added: equipment! You can now equip weapons from a list. The game dynamically displays a list of weapons carried and allows equipping/unequipping, shifting them to and from the inventory pool and player as needed, and displays their stats in a tooltip. Sounds unimpressive, but for me a big achievement. It also goes a long way to making the game start feeling like an RPG (just ask the CRPG addict) - meaningful character development and equipment that affects stats seem core to the old school compute RPG experience. For now, weapons and just have a couple of properties: the name, a description, a dmg/defense rating and a value. I am working on a system to enable them to boost stats (e.g. a sword that boosts strength, wands that boost magic power, wizard hats that give additional MP, etc). That's probably as complex as it will be in the game jam version, but a few future ideas such as useable weapons (e.g. ice sword casts ice bolt) or weapons that teach skills are possible things to consider. Splash screen: there is now a title screen. Feels almost like an actual game now! Visual tweaks: the UI fills out the page better (and is more responsive), with a few formatting tweaks... starting to look less eye-gouging! Dialogue code: has been cleaned up into a dialogue function which can create game-stopping modal popups or standard log msgs. NPCs: You can now talk to the two strangers as well as the farmer, who drop cryptic hints about the state of the outside world. Settings button: clicking a cog on the top right opens a settings panel which lets you manually save (autosaves every 30sec), or hard reset. 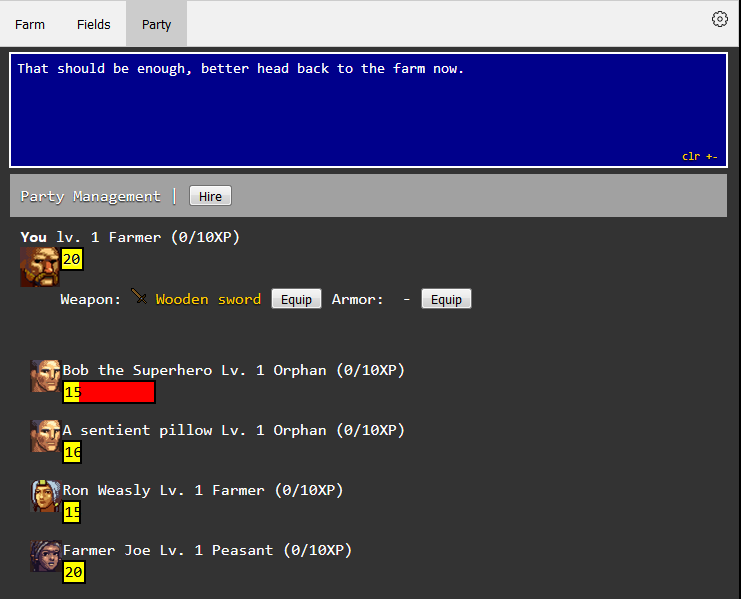 UI: Main text log can be cleared or minimized, Resources menu sections are now collapsible/expandable. Levelling up: now grants a whopping +1 maximum HP. Worker side menu: nothing in this yet but will later enable you to quickly recall and mass-assign workers. Getting this far helps me to clarify some game design scope goals. Seeing how long it takes, I know I need to keep things very basic for the game jam version. I want to have something relatively self-contained and "finishable" with some sort of victory scenario for the game jam, even if it is just like a "End of Chapter 1". Characters will only have "weapons" and "armour" for now. I will also create potions that heal characters by set HP amounts. This will be my main goal for the game jam, nothing more complicated than that. The minimal scope is not a limitation - just a first milestone goal. I have lots of complex ideas, the foundations of which are already being built into the game framework for future. For example, Weapons can be of various types, and these types can have various common properties. For example, swords do slashing damage and daggers do piercing. Armour likewise can have types: "light", "medium" and "heavy", in future versions magic or rogue characters should only be able to equip the appropriate armour. I also want to have a complex magic and abilities system, with skill trees and research, where the right selection of skills can harmonise or play off each other in (hopefully) interesting ways such as, say, dousing enemies in a pool of water then throwing an electric shield on your tank that shocks attacks, resulting in all nearby enemies get hit by electric attacks each time the tank is attacked. Realistically speaking, ambitious complex ideas is why I never finished a game before, so for now, these are just "high concept" things. I'm committed first to my simple game jam version goals, which means I might actually finish something. Now that I have a player character with stats, who can level up, and equip items, the next step will be enabling the hire of adventurers, and to be able to likewise gear and level them up. The next step is to then create a series of simple dungeons with generic skeletons to smash. At that point, the Game Jam version milestone will almost be met, and I just need to fill out a bit of content and pacing. There's still around 10 days to go, so... I think it's pretty achievable. And if there's time leftover, I can start adding more interesting and deep stuff like more complex equipment and a skill system. Fingers crossed! Some major major important progress was made since the last post, but with almost nothing to "show" for it: coding cleanup. Everything is now in objects and much, much better organised. Better functions have been written, so now instead of having gatherwheat(amount), gatherwood(amount), gatherstone(amount), etc. I just have gatherresouce(Resource, amount). Likewise, things like increasing or decreasing your "workforce" is simply handled within a single changeworkers(Resource, amount) function, which can accept positive numbers to increase or negative numbers to decrease assigned workers. There's other major structural improvement from using objects was giving them a "flagShow" property. The game now entirely automatically determines whether stuff like resources and upgrades appear or hidden depending on that property. There's also a special "Game.Flags.Visible.(...)" object - If I add a property with the same name as an HTML element, it will automatically show/hide that element, overriding the relevant object (if one exists). This means I can also tweak specific stuff for story purposes when needed, but leave everything else to the automatic handling. Still, I wanted to have something visible to show, so I added something a little more fun: combat! The absolute most basic text-based RPG combat. But combat nevertheless. You can engage a monster, and take turns gentlemanly-like punching each other until one drops. You can get XP and level up, though this doesn't mean much yet. If you die, you wake up in the fields with HP restored and can go in again for another round. The first stage of the game, the "incremental" resource gathering, is now pretty fleshed out. You can gather resources, upgrade your gathering equipment, meet two strangers who become allocatable workers, upgrade the farm itself, and finally, explore and find a cave, which unlocks stone, and on further explanation, iron ore, and eventually, opens up into the dungeon where you can fight the endless parade of skeletons. Next may be the hardest part of all - a working inventory system. Lots of elements needed for that - windows to display lists of gear, adding and adjusting the list as items are equipped, dropped, sold, etc. The game needs to know who has what equipped, and what stats it should boost. Usable consumable items. 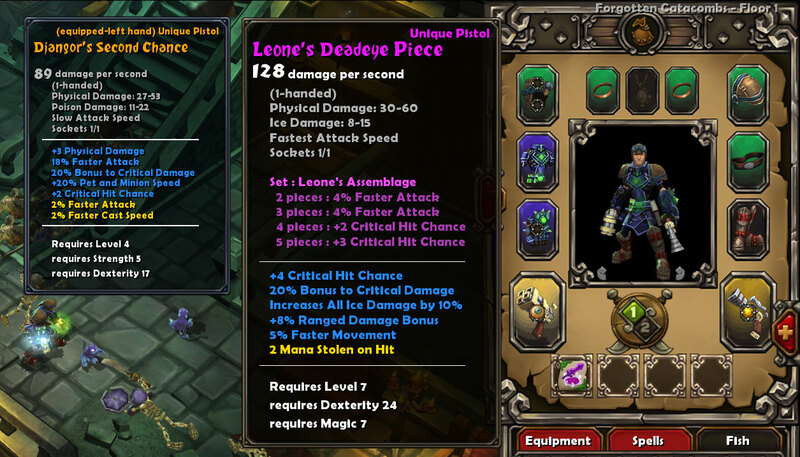 Tooltips showing stats of items so players can compare equipment choices. Probably the most work needed in the entire game! Once blocks snap to a grid, I can already see myself obsessively playing this just lining everything up into perfect squares.